Fur Coat Storage Beverly Massachusetts | Glama Furs, Inc. North Shore's Finest & Largest Furrier, Since 1974. 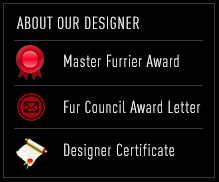 Glama Furs is the only furrier with CERTIFIED above ground fur coat storage vaults on the premises, in the Beverly, Massachusetts area.We specialize in fur coat storage, fur coat sales, fur cleaning, monograms, fur repairs and fur remodeling. All our storage is done on premises in our Temperature Controlled Vaults. Professional fur coat storage is very important for your fur coat to last long and always look as beautiful as it was when you purchased it. We offer great fur storage packages that include Fur Coat Storage, Cleaning, Conditioning, Glazing & Glamorizing. Glazing will restore the life and bring out luster and beauty of your garment after we have thoroughly cleaned it. Our special fur conditioning process adds longevity to your fur making it soft and supple. It conditions the fur pelts and the leather, removing dust particles and returning the sheen to your coat. Furs naturally attract dust and smells and our cleaning, conditioning and glazing process will replace some of the oils in the leather, making it soft. All coats should be at least cleaned and conditioned once a year. While your fur is with us we make sure we check all your hooks, buttons, rings and lining incase we need to make some minor adjustments for you. Where will your fur be spending this summer? Make sure it’s not stored in a basement. At Glama you’ll find these specially built, true temperature controlled Vaults with fireproof safety walls. Approved by all insurance companies. Inspect our Vaults and then compare others and you will see why we are the best option for your fur coat storage and cleaning. Glama Furs is the largest & finest fur store in the Beverly & Northshore, MA. We specialize in fur coat sales and storage. It was established in 1974 by award winning Designer and Master Furrier Manny Hatziioannou, who studied and graduated from L’École Française de Coup et de Couture Ltée in Paris. Our beautiful showroom is home to a large selection of designer fur coats, fur jackets and accessories from quality brands such as Blackglama, American Legend and American Ultra. We also carry top designers such as Guy Laroche, Zuki and Glama Couture for both men’s fur coats and women’s fur coats. We carry a wide variety of full length mink fur coats, designer mink coats, fur vests, fur jackets, fox coats, fox jackets, sable coats, beaver coats, chinchilla coats, sheared coats, , men shearling coats, women shearling coats, leather jackets, cashmere & fur capes, sable strollers, sheared mink reversible jackets, hats, scarves, purses, ear muffs, teddy bears, fox head bands, fur pillows, fur blankets, fur fireplace throws, and all fur accessories.